Happy Cyber Monday! Today is the last big day of pre-holiday sales and my personal favorite day to shop. Who wants to go to the mall on Black Friday and deal with the crazy parking lots and crowded shops? I would MUCH prefer to get amazing discounts from the comfort of my own home – and when I polled you guys on Instagram, most of you felt the same way! There are some seriously good Cyber Monday deals this year, and I’ve got all the deets you need to score the best deals today. Happy shopping! Editors note: Now is a great time to stock up on denim! Madewell jeans are my absolute favorite, and they never go on sale. Editors note: J.Crew has some of the cutest winter coats right now. Get them while they’re on sale! Editors note: This is such an amazing deal!! H&M rarely offers sales since their prices are already so reasonable. Stock up on everything from sweaters, to coats, to holiday party pieces. Editors note: & Other Stories is another retailer that usually doesn’t offer store-wide discounts. I purchased the black booties and cashmere scarf linked above, as well as the matching cashmere beanie and gloves. I also have my eye on that velvet blazer dress! Editors note: Get gifting!! Anthro is always my go-to retailer for cute and personal gifts. I love their monogram candles and mugs, and they have a great selection of easy gifts like passport covers, keyrings, makeup bags, etc. Grab that Secret Santa present on sale! Editors note: Now is the time to buy your New Years Eve dress! ASOS already has pretty good prices, so take advantage of this extra discount and get that fun sequin number you’ve been eyeing! Editors note: There are some amazing steals happening at Club Monaco right now, especially with 40% off sale items. I would focus on statement outerwear pieces and everyday cashmere. Editors note: Can’t go wrong with 50% off everything! I’m loving all of their cozy pieces right now – those faux fur slippers are so cute, and every girl needs that chic white wrap coat in their closet. Seriously loving all the sales going on!! And I love your outfit girl! Too cute! Love your round-up – I totally forgot about Club Monaco! Ah, these are some awesome Cyber Monday deals, friend! You look so cute, girl! These are some great sales and picks! We’ve got some similar taste! Much prefer Cyber Monday shopping over Black Friday shopping these days! #homebody .. I didn’t even think of shopping & other stories .. hate I missed out on those deals! Ah you found so many great deals!! Can’t believe all the great sales that were going on! 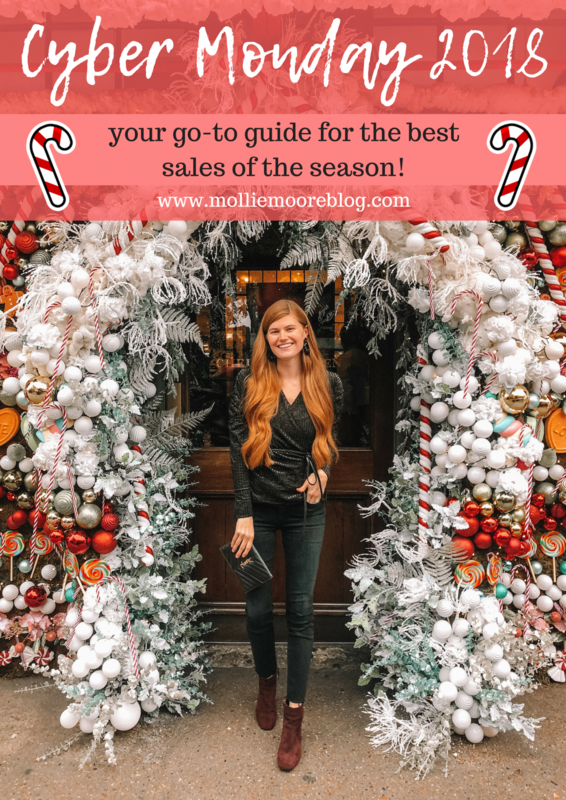 This sales guide is so good! Thanks for sharing. So many great deals from Cyber Monday! I definitely shopped!